How well do FTSE 100 listed companies publicly report their efforts to measure, manage and reduce their impacts on the environment? In our latest report, we present our research into the environmental sustainability reporting trends within the UKs largest companies. 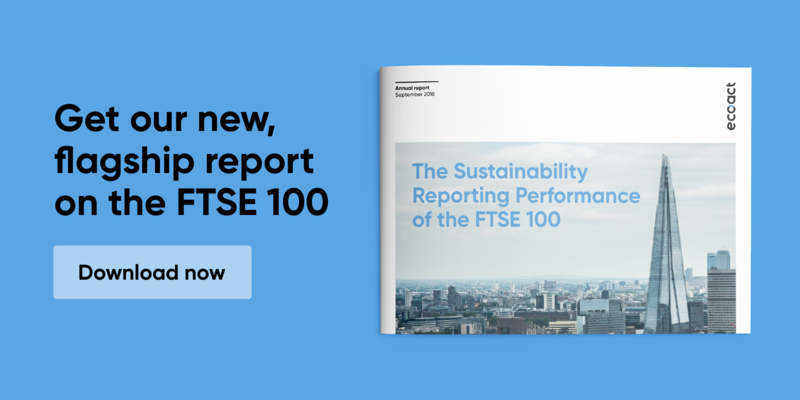 We also present the FTSE 100 sustainability leadership table, which ranks companies on their performance, acknowledging the pioneering climate leaders. Download the report to find out how companies are managing climate risk and future proofing business operations; innovating to maximise on energy and emissions reductions opportunities; responding to legislation and investor calls for action; and shifting towards a low-carbon economy. 73% of companies disclose Scope 3 emissions.